Albeit a little pre mature as we are only 12 days into October I decided to do a little digging today. How are the first couple weeks of October sales and what should we expect to see at months end? 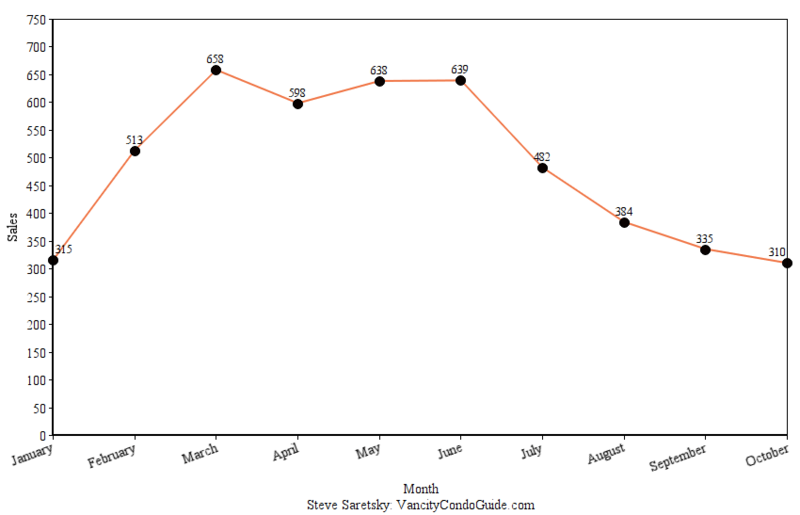 Early sales numbers show we are on pace for another slow month. In fact, if these numbers keep up we will have fewer sales than September. Maybe the real estate pundits will blame this slowdown on the Thanksgiving Turkey! I pulled the data for the first 11 days of October. No doubt a long weekend slows activity, but luckily Thanksgiving falls basically on the same week each year. So if these numbers continue we should expect to see 65 sales in Vancouver East, 76 in Vancouver West, 62 sales in Richmond, 45 sales in Burnaby, 631 sales in REBGV. 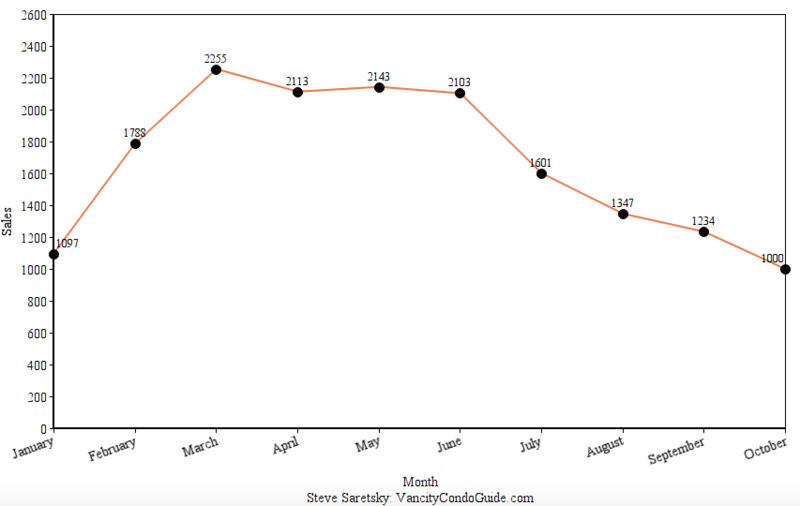 Here’s how the projection looks on a graph which shows detached sales from January through to Octobers projected number. Although sales activity could very well pick up after Thanksgiving it’s also important to note that many of the sales which have been reported so far in October are actually sales from September which have now rolled over into October as the board finally gets around to processing some of those deals. (I’ve mentioned before how I think this a flaw in the way the Board reports data). 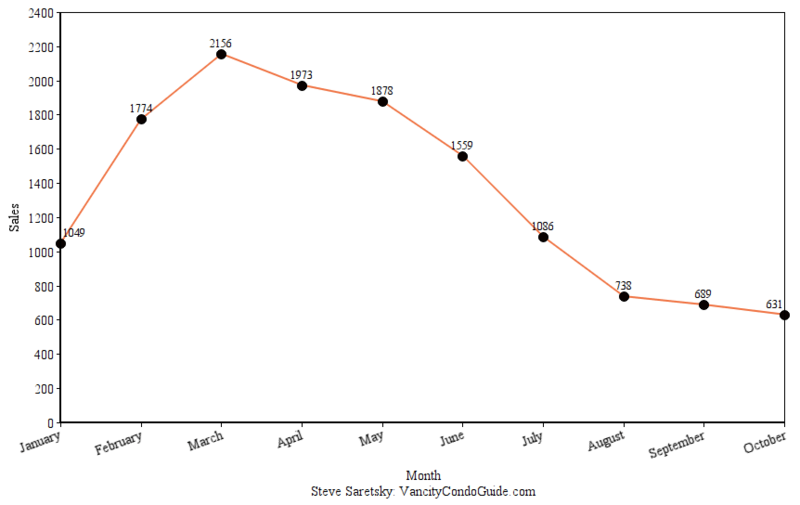 At this pace we should expect Vancouver East sales to hit 82, Vancouver West 273, Richmond 121, Burnaby 127, REBGV 1000. This would would mean 234 fewer condo sales than September, a 19% drop month over month and that hasn’t yet factored in How The Stress Test Could Curb Demand even further. The only time sales haven’t picked up from September to October in Metro Vancouver was back in 2008 when sales and prices dropped from the financial crisis in the United States. Although sales might pick up post holiday turkey don’t forget much of these first 11 days of sales are actually trickle over from September. From a boots on the ground perspective things are very slow. Keep in mind the impending change to lending polices October 17 will likely curb demand even further.